Written in the style of a diary, Jesse Ball’s How to Set a Fire and Why tells the story of Lucia Stanton, teenage anarchist and aspiring arsonist. She’s halfway through high school, and was just transferred to a new district after a violent incident transpired between Lucia’s pencil and a former classmate’s neck. Friendless, Lucia tries to find her footing in this new school but can’t help herself from getting drawn into more trouble: she hears murmurings of the “Sonar Club,” code for the Arson Club, and quickly finds herself enmeshed in their secret anarchic meetings. Her diary is a tangle of stories, balanced between accounts of the day’s events and predictions of what may come. These predictions provide the novel with a woozy narrative instability, intentionally difficult to decode. 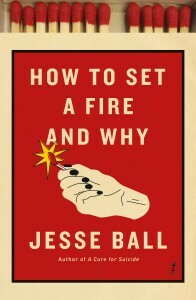 Typically, Jesse Ball’s novels are surreal experiments that feel more like work of an artist than they do a novelist. His previous books are each captivating in their peculiarity and welcome readers to theoretically unravel their events and ideas. This is not the case with How to Set a Fire and Why: it is a departure for Ball, as the novel’s substance almost entirely surrounds the authenticity and honesty of Lucia’s voice and the organization of her thoughts. Readers will be tempted to grapple with the notion of fire and assess its greater meaning, but there are signs throughout the novel that frame this story as a deceptively simple, literal tale. Reflecting on an Arson Club meeting, Lucia remarks that the “the organization of these groups varies from place to place, but it really doesn’t matter how the organization is handled, or even if there is any, because the whole thing is just people burning things, so you don’t need an organization in the first place.” The emergence of this passage in a book that’s almost cluttered with tangents, predictions, and confessionals is particularly apt, as if Ball’s explaining why his novel seems so unconventional. Later in the novel, Lucia’s aunt shares her rules about gardening: “plant some things almost randomly. Let weeds grow. If you like the weeds, then weed the plants out.” Again, an explanation for those moments in How to Set a Fire and Why that feel flat, unnecessary, or lifeless. He’s committed himself to Lucia’s narrative, and accepts any of the baggage that a precocious teenage mind might carry along. “I spend most of my time thinking about joining the Arson Club,” Lucia writes, “which I will do, and I am writing a pamphlet about setting fires. I have not actually set any fires yet, but I can do a better pamphlet about it anyway than some people who (maybe) have.” Strangely, Lucia’s sentiment here suggests a statement about Ball’s authorship of How to Set a Fire and Why: he may not be a teenage girl, but can do a better narrative about it that some people who (maybe) are. Lucia is a genuine, heartbreaking voice, and Ball’s prose is a memorable feat of transformation, but the novel needs something more than just a convincing narrator. As the title suggests, Ball chooses discourse over spark.